From approximately 1900 to 1930, the bungalow was a popular house type throughout the United States. The term “bungalow” was borrowed from nineteenth century English usage and the form from the British Indian colonial adaption of a Bengali house. Within America, regional variations of the one- to one-and-a-half story house with a large porch developed in response to climate, building practices, and local culture. As was the case in the Chicago area, the popularity of the bungalow can be seen primarily in the Milwaukee neighborhoods built during the booming real estate era of the 1920s and is associated with the “bungalow belt” of the city’s periphery and first-generation suburbs. 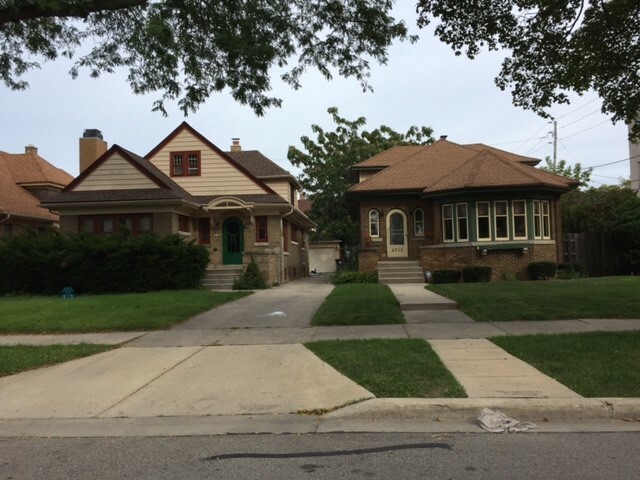 Milwaukee’s bungalows include those characterized as “California Bungalows” with wide barge boards framing the roof-line, supported by wooden brackets and other Arts & Crafts era details. Another popular version is the brick bungalow with sunroom that has been called the “Chicago Bungalow,” given its dominance in the upper Midwest. Milwaukee builders chose both styles but also innovated by using the Chicago Bungalow’s “sunroom bay” as the house’s entryway. More than an architectural style, the bungalow represents the first modern house for a working-class to middle-class population. The bungalow floor plan puts the public rooms on one side of the house and the private rooms on the other side. From front-to-back, the public rooms include the living room, dining room, and kitchen. The twentieth-century modern bungalow had the three-fixture bathroom (toilet, sink, and bathtub) as a standard feature of the new home. With this and other amenities, the bungalow was a modern house that established the new standards for American domesticity. ^ Anthony D. King, The Bungalow: The Production of a Gobal Culture (London: Routledge & Kegan Paul, 1984). ^ Joseph Bigott, From the Cottage to the Bungalow: Houses and the Working Class in Chicago, 1869-1929. (Chicago: University of Chicago Press, 2001). ^ King, The Bungalow, 134. ^ Dominic Pacyga and Charles Shanabruch, The Chicago Bungalow (Chicago, IL: Chicago Architecture Foundation, 2001). ^ Thomas C. Hubka and Judith T. Kenny, “Examining the American Dream: Housing Standards and the Emergence of a National Housing Culture, 1900-1930,” Perspectives in Vernacular Architecture 13, no. 1 (2006): 49-69. Bigott, Joseph. From the Cottage to the Bungalow: Houses and the Working Class in Chicago, 1869-1929. Chicago: University of Chicago Press, 2001. Hubka, Thomas C., and Judith T. Kenny, “Examining the American Dream: Housing Standards and the Emergence of a National Housing Culture, 1900-1930.” Perspectives in Vernacular Architecture 13, no. 1 (2006): 49-69. King, Anthony D. The Bungalow: The Production of a Global Culture. London: Routledge & Kegan Paul, 1984.